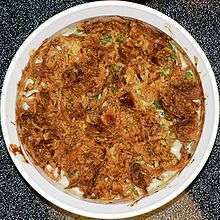 Green bean casserole is a casserole consisting of green beans, cream of mushroom soup, and french fried onions. It is a popular Thanksgiving side dish in the United States. The green bean casserole was first created in 1955 by the Campbell Soup Company. Dorcas Reilly led the team that created the recipe while working as a staff member in the home economics department. The inspiration for the dish was "to create a quick and easy recipe around two things most Americans always had on hand in the 1950s: green beans and Campbell’s Cream of Mushroom Soup." In the 1972 version of the Good Housekeeping Cookbook the recipe replaced the creamy mushroom soup with sour cream. 1 2 "Dorcas Reilly: The Inventor of Green Bean Casserole". Campbell Kitchen. Archived from the original on 2007-09-27. Retrieved 2011-01-02. ↑ Rujikarn, Sherry. "The Evolution of the Green Bean Casserol". Good Housekeeping. Hearst Communications. Retrieved 25 September 2016. ↑ Colegrave, Stephen; P.J. Gray; Stanley Hunter (2003). Bear cookin': the original guide to bear comfort foods. Haworth. p. 48. ISBN 978-1-56023-426-5.